The aftermath of the crash involving Prince Philip. And those railings you can see could have a spiritual significance, as we reveal below. Psalm 116:8 For thou hast delivered my soul from death, mine eyes from tears, and my feet from falling. 9 I will walk before the LORD in the land of the living. It’s good being a member of the Royal Family if for no other reason than this: All over the United Kingdom people are praying for you. 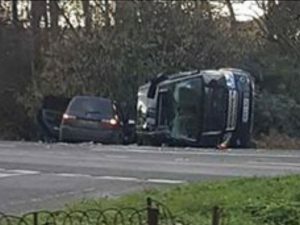 His Royal Highness the Duke of Edinburgh was involved in a car crash yesterday afternoon while turning right onto the A149 by the Queen’s Sandringham estate at the junction with the B1349. A Kia, coming round a bend on the A149 from the south, hit Prince Philip’s Land Rover Discovery in the side. The Discovery was sent rolling over by the impact. It ended up on its driver’s side in the verge. The Kia stayed on the road and finished its journey in the hedge right by the Land Rover. The speed limit on the A149 is 60mph, as on every UK single-carriageway road. Norfolk Council have now voted to reduce the speed limit to 50mph. Astonishingly, everyone walked away from the crash. Prince Philip and the other driver were both breath tested after the collision and gave negative readings. According to Sky News, one Roy Warne was passing by and first helped the occupants of the Kia. They included a baby, unharmed in the rear seat. The baby’s mother sustained a cut to her knee while her passenger broke her wrist. 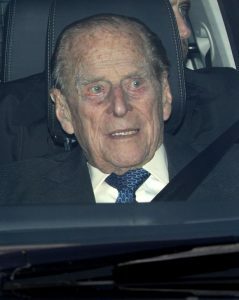 Prince Philip, HRH Duke of Edinburgh, in the front seat of his Land Rover Discovery. Mr Warne then went to the other car. He said he didn’t realise at first it was HRH inside the overturned Land Rover. He explained, ‘I told him to move one of his legs to make room for the other leg, and then I put my hands under his arms and helped ease him out backwards. Mr Warne, 75, added the Duke was ‘shaken up’ and was ‘asking if anyone was hurt’ after the crash. We can thank God firstly for how well cars are built these days. There is so much wrong in our society, it is easy to forget how much good there is. Modern safety standards for vehicles is one of them. The Coventry Evening Telegraph suggests Prince Philip’s Discovery may have been strengthened in a special facility. However, none of that applies to the Kia. Not so long ago, a small car hitting a large one head on would have crumpled to a pack of scrap metal, killing everyone on board. But equally, for everyone to walk away after such a terrible collision can be seen as ‘amazing’ or as a miracle, depending on one’s point of view. And here is where the prayer comes in. At our New Year with the Celtic Saints event just passed, we all prayed for the Queen and for the Royal Family twice a day. Our prayers were sometimes in our own words. At other times we prayed using the words in the Book of Common Prayer. Those prayers are not specifically for protection from perils, but ‘health and wealth’ and ‘to bless’ and ‘prosper’ include that, by the grace of God. Moreover, all over the UK, when traditionalist Anglicans meet for Matins or Evensong, they pray these prayers. There may not be many such today, but it still happens. All that prayer is heard at the Throne of Grace. So we can offer prayers of thanksgiving today for such a dramatic deliverance in answer to prayer. And if your church does not regularly pray for the Queen and her ministers, for the Royal Family and for all in authority, perhaps it should start. 1Tim 2:1 I exhort therefore, that, first of all, supplications, prayers, intercessions, and giving of thanks, be made for all men; 2 For kings, and for all that are in authority; that we may lead a quiet and peaceable life in all godliness and honesty. The remains of Butler’s Cross stand at the junction where the accident occurred right opposite where the cars ended up. In what may be the grace of God, the junction where the crash occurred is marked by the remains of a medieval standing stone cross. 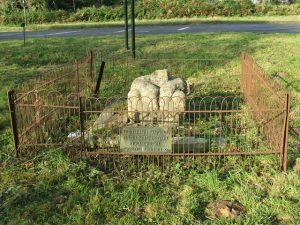 A website says it is now ‘consisting of the base and a fragment of the shaft, set on a modern plinth of stone and tile with a plaque and surrounded by remains of a rusty iron fence’. We can see the top of the railings, the ‘iron fence’ as they put it, in the crash photo above. The crash photo was taken from the very site of Butler’s Cross. The Queen spoke recently at Sandringham WI, saying “Of course, every generation faces fresh challenges and opportunities. As we look for new answers in the modern age, I for one prefer the tried and tested recipes, like speaking well of each other and respecting different points of view; coming together to seek out the common ground; and never losing sight of the bigger picture. To me, these approaches are timeless, and I commend them to everyone.”. A very Christian approach from someone with, I believe, a sound faith in Christ. God bless Her Majesty. This is a very timely reminder to the Nation currently riven by fractious argument over BREXIT, each side in entrenched positions. Much of the debate is “ad hominem”, attacking the person rather than their position. Remainers and Leavers alike should, I believe, respect their opponents in that they genuinely feel their opinion is in the National interest, wrong though they may be. Where is the “common ground” we should be seeking? First, I suggest the value of truthfulness and honesty in debate based on fact and reason, rather than making knowingly specious points asserted in favour of one’s position in the hope that they would persuade some. Secondly, respect for democracy. The people might make the “wrong”decision, but it is more important for the cohesion of society and the common good that their decision is respected and acted upon. Without this we on the road to anarchy or dictatorship. Stephen’s analysis that the EU is godless and hence that we should withdraw from it convinces me, but I hope I duly respect others who disagree. Incidentally, my 1990s copy of the Prayer Book includes in the list of Royalty “Elizabeth the Queen Mother” and the “Princess of Wales”. Camilla, though likely to be our Queen consort, is currently not specifically mentioned. if the Princess of Wales is not specifically named as Diana, then it is Camilla. Charles simply decided to have her generally referred to as “Duchess of Cornwall” for public relations reasons. Diana also was entitled to be known as Duchess of Cornwall (and Duchess of Rothesay) because Prince Charles is Duke of Cornwall and Duke of Rothesay. You may remember that he was often known as the Duke of Cornwall before the Prince of Wales ceremony at Caernarfon. Charles and Camilla use the Rothesay title in Scotland. She will (subject to who dies when) become legally Queen Consort as Epistle says, but again Prince Charles for public relations reasons has suggested another title, Princess Consort. In this case, he has made it up, and there is no proper precedent (only “Prince Consort”, but Albert could not have been king). Is it possible that the Prayer Book has been updated, though ? Yes, I am not remaining a great supporter of the Royal Family, however much I appreciate the Queen and her duteous approach to the job of Monarchy. Someone needs to inject Philip with a bit of wisdom in his old age, and stop him damaging the Image of the Royals. Heaven knows, when Charlie boy comes to the throne, no one knows what he will be like. He certainly is an odd fellow now! The pageantry and play acting surrounding the Royals I find difficult to tolerate now. Like anyone else, they are just people, the latest ‘clanga’ crash of Philip only demonstrates all too well! You mean ‘Prince Charles’ or ‘the Prince of Wales.’ We don’t do disrespect here. Or the Duke of Cornwall or the Duke of Rothesay. I have a reprinted Prayer Book of 1853, which in “A Prayer for the Queen’s Majesty” refers to Queen Victoria, and the prayer for the Royal family refers to “Price Albert, Albert Prince of Wales”. It is hence updated from time to time to include the current senior members of the Royal Family. I presume from Stephen’s piece that the latest version does not specifically mention the Princess of Wales or the Duchess of Cornwall, and hence Camilla. As an Anglican, I recognise the Queen as our annointed Queen and head of the established Church in England, if not I understand in Wales. Camilla, and the Prince of Wales’ s consort is I understand technically the Princess of Wales and will be Queen Consort, despite the practice of referring to hear as Duchess of Cornwall. The Duchy, of which the Cornish are rightly proud, predates the Principality of Wales, 1337 and 1343 respectively. Diana is now sadly dead, and I do not therefore see an impediment to Camilla being Queen. Would her marriage in a Registry Office be considered adequate by the Chuch of England, who would not officiate in marrying the couple at the time — quite a big rejection, really.